Self-service data analytics for business leaders. The Business Intelligence module provides an exciting new way for power users and key decision makers to consume MIS information and create actionable analytics. Using a clean and intuitive drag and drop interface, users can investigate information relationships and trends previously only possible by expensive and time consuming database query and analysis. Allows users without specialist database or development skills to create and share spectacular infographics and charts based on information directly from their MIS. 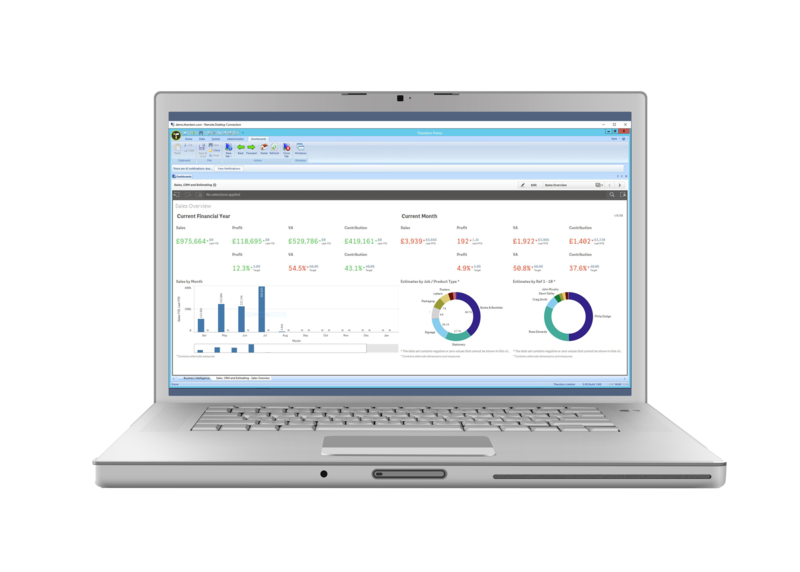 Created by Tharstern with the help of our customers, the standard dashboards demonstrate the power of the Business Intelligence module whilst providing the key analytics required by most companies. There's no need for high cost development, coding or specialist report writing. A simple to use drag and drop interface enables the creation of powerful 'I’ll know it when I see it' solutions by almost anyone. Work with our provided visuals and alter to your needs, or start from scratch. Create simple charts or highly complex illustrations that instantly respond to changes in context. Search the vast number of dimensions, measures and metrics in your data set to find the one you require in seconds using simple, natural grammar.